EDIT: This is now a rather simple question. I have a 2D sprite that really needs the precision of a polygonal hitbox. The 2D, tile-based world around it uses a tile Mesh for efficiency reasons, and thus has a Mesh Collider. In a 2D, tile-based, procedurally-generated, chunk-based exploration game (in Unity 4.5), I have a player ship which uses a Rigidbody 2D and a Polygon Collider 2D for collision detection. This worked fine back when I used a Rigidbody 2D / Box Collider 2D for world tiles. However, this is horribly slow, so I replaced the discrete blocks with a tile mesh, using a Mesh Collider and other associated paraphernalia. What have I looked at so far? Well, I verified that the (2D) ship actually passes through the collision boxes in the Scene View. Also, neither of the colliders "Is Trigger". Since there seems to be no official documentation on how to actually use meshes (is there? Where? ), I can't find out whether Mesh Colliders and Polygon Colliders actually can interact. Because one is 2D and one is 3D, does this not work? If so, then what should I do instead? I tried using a Box Collider [3D] for the ship, but this didn't work either. I could have potentially made a mistake here, though. Am I supposed to handle the collision manually (with the OnCollisionEntered [or something] method)? Before, the rigidbody2D objects handled everything automatically. Otherwise, is there any other possible reason the collision might not work? 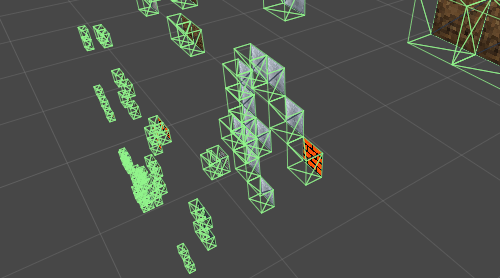 Well, I'm quite disappointed there seems to be no built-in way to do this in Unity. My solution was to attach a GameObject to the player that would read the block data from the world and create (pooled, of course) real but invisible "collider blocks" with Box Colliders 2D in a small area around the player, such that the player could collide with blocks near them. It works great, and I also implemented an algorithm to spawn rectangular collider blocks over groups of blocks; this eliminates the "ghost pixel" bug in the 2D physics engine. Uni2D plugin (https://www.assetstore.unity3d.com/en/#!/content/3826) automatically creates 3d colliders (as a group of mesh colliders) from any 2 texture with transparency. A bit expensive but works. Not the answer you're looking for? Browse other questions tagged unity3d collision-detection mesh tile unity3d-2dtools or ask your own question. Unity how to find if object intersects with mesh collider (not bounding box, the actual mesh)? How to detect mesh collision in Unity3d?